The facility was in good shape, but lacked easy access to food. It did not have a restaurant open for most of the day, forcing us to go and eat out in a dangerous city. Staff !! Amazing people are working there!! I felt like I am at home. Very convenient location and staff was very nice and very helpful. The food service was very kind. It made the experience very pleasant. Considerable options for vegetarians. Really nice hotel close to everything. But the best thing of all is it's hotel staff. They make you feel welcome, they are so helpful and kind. They are there to help you and make you feel home! If you are coming to Ciudad Juarez for your consulate interview, this location can’t be beat. It is right across the street from the consulate and medical center and right behind the mall which has restaurants, shopping and a movie theater. If you need to go somewhere that is not in the consulate area, they have a shuttle that can take you. There is a pedestrian bridge that you can take to cross the street so there is no need to worry about traffic. The rooms are clean, but small. The bed was a little uncomfortable but not terrible. The hotel is very secure and the staff checks on guests regularly. Breakfast is served every morning from 6am-10am and it’s not bad. Overall, we were very comfortable during our 9 day stay, and every place we needed to go was very accessible. No need for a car. It is great to be across from the American Consulate. We could see the front of it from our window. The US consulate is directly across the street (foot bridge over the very busy street) and the ASC is about 100 yards from the consulate. Hotel is decent and breakfast is good. Selection of fruit, breads and hot dishes plus coffee and juice. Hotel staff is decent but not very friendly. Shower pressure is incredibly poor but water was hot. Takes a while to get wet and to rinse off. Wonderful experience, comfortable and clean, Staff was very friendly an its located within minutes from shopping mall and restaurants. The hotel is Good in general, but the room is way to small. Uncomfortable beds and front desk not really helpful other than that it's very conveniently located. The staff was very wonderful and the breakfast was delicious. Room was very clean but the mattress was as hard as a rock. Nice hotel pretty clean, the stuff is super nice, they got free transportation, breakfast, snack and wi-fi. Overall it's a pretty good hotel Just the Internet is a little slow, but what you expect when all the guests are using it. City Express Junior Ciudad Juarez Consulado places you next to American Consulate and within a 10-minute walk of Plaza Las Misiones. This 128-room, 3-star hotel welcomes guests with conveniences like free in-room WiFi, free self parking, and a 24-hour business center. Start your day off right with a free hot/cold buffet breakfast, served each morning from 7 AM to 10 AM. A flat-screen TV comes with cable channels, and guests can stay connected with free WiFi and wired Internet. Beds sport down comforters. Other standard amenities include free bottled water, a safe, and a phone. 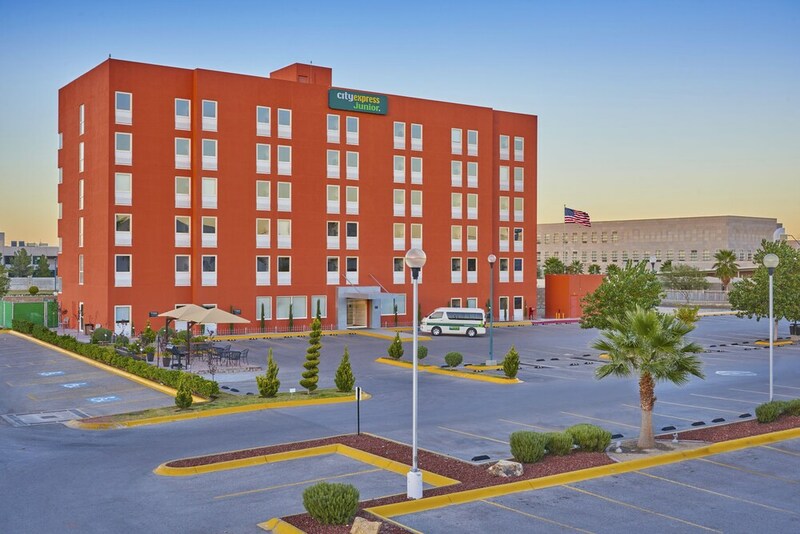 Guests of City Express Junior Ciudad Juarez Consulado enjoy access to free WiFi in public areas, a meeting room, and a 24-hour business center. You can take advantage of free parking, along with a free area shuttle. Front-desk staff can answer questions 24/7, and assist with luggage storage, dry cleaning/laundry, and concierge services. Additional amenities include coffee/tea in a common area, a computer station, and laundry facilities. Free hot/cold buffet breakfast is served daily from 7 AM to 10 AM. The preferred airport is Ciudad Juarez, Chihuahua (CJS-Abraham Gonzalez Intl. ).